You might have noticed that when you share your website or blog posts on Twitter, it doesn't show any rich content of the webpage like title, description, thumbnail etc. 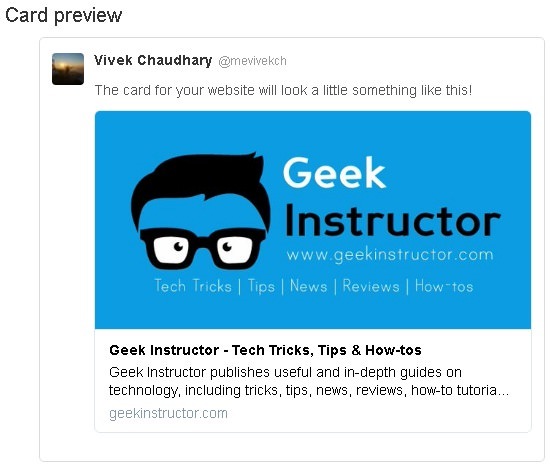 Now Twitter has introduced summary cards tags which helps you to add your website's rich content in the tweet. The summary cards allow Twitter to better understand what information (such as title description, thumbnail etc.) you want to display when your website link is tweeted. It is similar to the Facebook open graph tags and Google rich snippets. These summary cards are super easy to implement into your own Blogger website or blog. This tutorial will guide you how to do it! twitter:card The name of the Twitter card you want to use such as summary or summary_large_image. twitter:site The username of your website's Twitter handle account. twitter:creator The username of the creator or writer. twitter:title The title of the webpage or article. twitter:description A short description of the webpage or article (the optimal character length is 150-160 words). twitter:image The url of the image that appears when your content is shared on Twitter. The image should be less than 5MB in size. Now type <head> tag and press enter button to search it. Add the following piece of code just below the <head> tag and then tap "Save template" button. That's it. Replace @site with the Twitter username of your website or blog. Replace @creator with the Twitter username of the author (you can add your personal Twitter account here). Replace your-blog-cover-pic-here with the URL of your blog cover picture. It will appear on the homepage and archived pages of your Blogger blog. To check if all Twitter summary cards are working properly on your Blogger blog, you can use Twitter Card Validator tool. This tool lets you preview how your content will look when it's shared on Twitter. Simply enter any valid URL of your Blogger website and tap "Preview card" button. 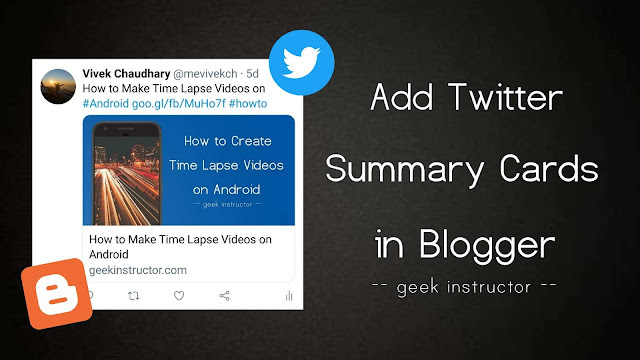 We hope you find this guide helpful to add Twitter summary card tags in your Blogger blog. If you are facing any problem, feel free to share it in the comment section.